Have you ever thought of cherishing friendship with a cake? Jessy is the one. Upon her two colleagues' birthdays, she thought of celebrating for them on the same day. "They have been so helpful for the past three months." 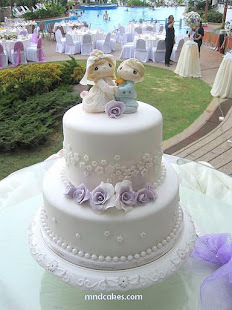 On their special day, Jessy prepared to give them a special cake, "Try to make it very special..." I described to her my idea of the cake and she was happy to accept it. 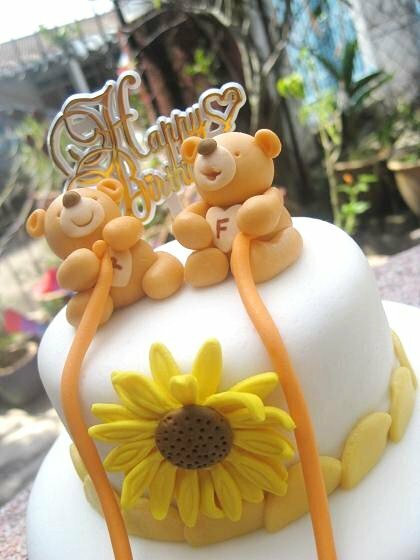 2 tiered cake with bright yellow to match the orangy Lovey bears which carry the initials of their names on their hearts respectively. 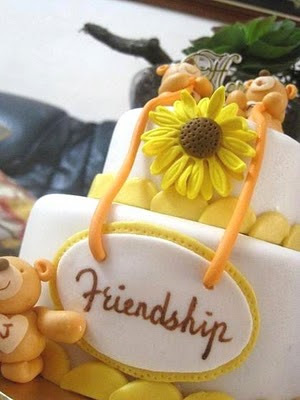 The sunflower represents the blossoming frienship that develops subtly among the three ladies. 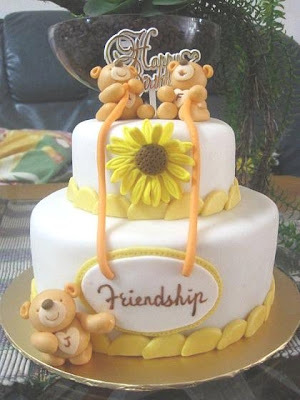 The two birthday bears are singing while holding tight the rope of friendship. Where is Jessy? Oh yeah, she is taking care of the friendship plate which is so valuable to her. Wish their friendship lasts forever.